A quick note to all you #TransitHubbers out there! While TransitHub aims to be a community for commuters, there's an awesome film festival for commuters, too: the Toronto Urban Film Festival (TUFF), an underground "silent" film festival happening now until Sept. 18 on a TTC subway station screen near you. Tomorrow (Wed. Sept. 14), however, there will be a special event at the Drake Hotel (just a few blocks away from the Gladstone and Queen streetcar stop): a special panel discussion on urban screens as an art form at 6pm. 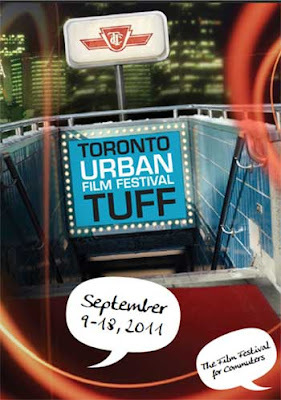 In addition, the Drake Hotel will also be hosting a looped screening of all of the 1-minute films from TUFF from 11am to 5pm over the weekend (Fri. Sept. 16 to Sun. Sept. 18). So you've got another reason to head over to the lively Gladstone and Queen Hub. The details are below, and we hope to see you there. Happy #TransitHubbing! Don’t take the subway? Want to watch TUFF films in comfort? Gather some friends or stop by on your own, and spend an hour with TUFF. All 8 programs will be projected in a 67 minute loop in Room 222 at the Drake Hotel. Grab a drink, relax, and enjoy some of the best ultra-short short films around. Admittance is free. Join our panelists Rebecca Carbin, Angie Driscoll, and Janine Marchessault in a lively discussion about urban screens, the new artforms and genres they are engendering, as well as the issues at stake in producing for a ‘general’ public audience. Moderated by Sharon Switzer. Admittance is free.